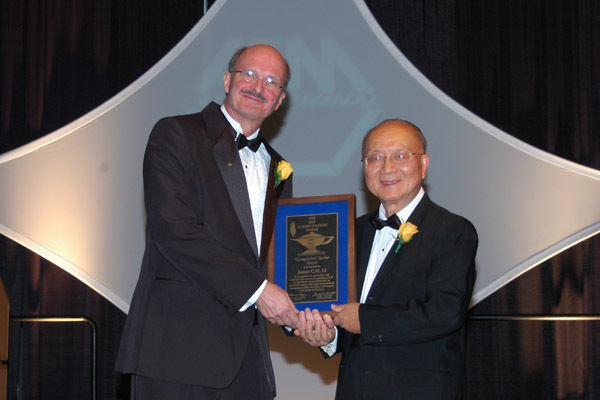 Professor James C. M. Li, at right, receives the Albert Easton White Distinguished Teacher Award from ASM International in 2007. In the world of materials science, James C. M. Li, the Albert Arendt Hopeman Professor of Mechanical Engineering and professor of materials science, is an iconic figure. He is a world-renowned researcher who found a way to produce metallic glass for the first time. He has made significant contributions to the understanding of how materials deform and become damaged under mechanical loading. He has won just about every award in his field short of a Nobel Prize. "I must say I have been very lucky in many of my ventures," Li has said. However, his University of Rochester students and fellow faculty members know there is a great deal more behind Li's success. They regard Li—who retires at the end of this school year—as a brilliant but humble, hard-working colleague. For more than 40 years at the University, his pragmatic advice has helped many of them shape their careers. John Lambropoulos, chair of the Department of Mechanical Engineering, is among those who have benefited from Li's advice. Soon after Lambropoulos joined the department in the mid-1980s, Li urged him to become involved in the materials science program as well. "So I did that. All of a sudden I could recruit from twice as many students for my research purposes," Lambropoulos says. "That advice was a very important, long-term influence on my career." "Over the years," Lambropoulos adds, "we have looked up to Jim Li as a colleague who sets a brilliant example with his outstanding research, his considerate and mentoring attitude towards students, and his stellar contributions of service both at the University and also at the national and international levels." Li, who grew up in China before and during World War II, earned his bachelor's degree from the National Central University in China in 1947 and his master's and doctoral degrees from the University of Washington in 1951 and 1953, respectively. After his postdoctoral appointment at Berkeley, he worked briefly at the Carnegie Institute of Technology and at Westinghouse before beginning a 12-year stint as a staff scientist at the E. C. Bain Laboratory for Fundamental Research at U.S. Steel Corp. in 1957. That was where "I built up my reputation entirely," Li observed in a 2006 profile. He first became acquainted with dislocation theory there, which was critical for much of his later work. One of his most widely cited contributions to materials science came at his next position, as manager of the Strength Physics Department of the Allied Chemical Corporation. Li developed a method to produce "glassy metals" by freezing molten metal so quickly that the atoms cannot revert to a crystalline state. His research formed the basis for an entire industry. Engineers use this material to create electrical transformers that transfer energy with a much higher efficiency than conventional transformers. Li has worked for 45 years on similar materials that are mechanically superior to their traditional counterparts—being stronger, tougher, and more resistant to corrosion. Li, who has published more than 350 papers and received more than 50 patents, has recently focused on new catalysts for fuel cells to improve their durability and reduce costs. One of his projects involves eliminating the "whiskers" that can grow between the electrodes of a battery, shorting the battery over time. This could have important applications where batteries are difficult to replace, for example in orbiting satellites. Li arrived at Rochester in 1971, and according to one colleague, has become something of a legend among his students. They marvel at his uncanny ability to dissect—in just a few minutes—the flaws in a project that took a whole semester to finish. "He's very smart—and I mean an order of magnitude more than most other people," says Stephen Burns, professor of mechanical engineering and of materials science and former department chair. Burns came to the University soon after Li to help him establish a materials science program here. "He has great skills as a mathematician. His physical insight is very good. His understanding of the laws of physics is great, but the area Jim is really known for is thermodynamics. He is very capable of understanding the overall energy balances in very complicated systems – and picking just the gems out of it and using those gems to get a pretty good understanding of what is going on." "There's something about Jim that I rarely see in other scientists whether at the University or outside," Lambropoulos adds. "He not only understands theory very, very well, but he's also a very good experimentalist. And he can do computational work— computer simulations. That combination of theoretical and experimental and computational work is very rare." So it is all the more impressive to Lambropoulos that, despite Li's lofty stature as a researcher, he has carried a "substantial teaching load forever. If someone of his visibility was to say 'I'd rather not teach,' one could make the case he really shouldn't. But he never did that." Indeed, when Materials Science and Engineering devoted an entire issue to Li, it suggested that in addition to his "seminal contributions to understanding . . . mechanical properties of materials ... perhaps the most important legacy of Professor Li has been the outstanding cohort of scholars that he has successfully guided throughout his long career." Li's more than three dozen PhD students are scattered through industry, government, and academia. They include university faculty members; corporate researchers, engineers, technical officers, and administrators; and even an expert in intellectual property law. 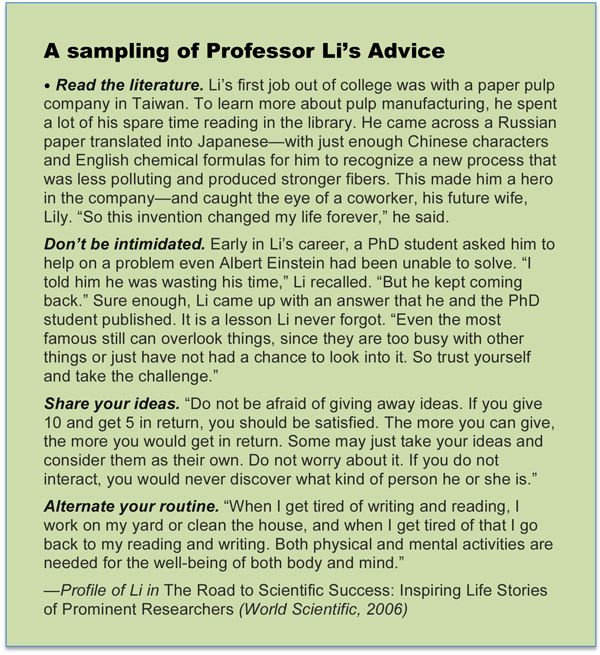 "You should know your students before you select thesis topics for them," Li explains. "You should recognize their strengths and develop them further but also strengthen their weaknesses. My philosophy is that a student should possess all of the necessary tools for research." One of his former students, Fuqian Yang, a professor in the Department of Chemical and Materials Engineering at the University of Kentucky, says Li "constantly emphasizes the importance of fundamental knowledge for research and always encourages his students to explore the important problems through reading literature and attending conferences. He had a decisive role in shaping my career." Former student Paul Vianco, now a distinguished member of the technical staff at Sandia National Laboratory, says that Li "expected a great deal of initiative and self-reliance from his students. When there was a challenge, Li had the talent to provide just the right amount of information that allowed students to make further progress on their own. "Even after having graduated from the University of Rochester 27 years ago, I still hold Li as my mentor, who will always exemplify scholarly endeavor and intellectual creativity yet, at the same time, is a decent, considerate human being. Certainly, this combination of attributes is hard to find in this day and age."